Satellite Soil Moisture Retrieval: Techniques and Applications offers readers a better understanding of the scientific underpinnings, development, and application of soil moisture retrieval techniques and their applications for environmental modeling and management, bringing together a collection of recent developments and rigorous applications of soil moisture retrieval techniques from optical and infrared datasets, such as the universal triangle method, vegetation indices based approaches, empirical models, and microwave techniques, particularly by utilizing earth observation datasets such as IRS III, MODIS, Landsat7, Landsat8, SMOS, AMSR-e, AMSR2 and the upcoming SMAP. 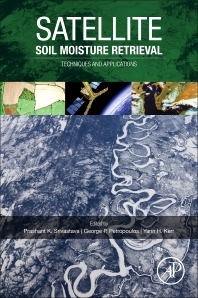 Through its coverage of a wide variety of soil moisture retrieval applications, including drought, flood, irrigation scheduling, weather forecasting, climate change, precipitation forecasting, and several others, this is the first book to promote synergistic and multidisciplinary activities among scientists and users working in the hydrometeorological sciences. Dr. Srivastava is working in Hydrological Sciences, NASA Goddard Space Flight Center on SMAP satellite soil moisture retrieval algorithm development, instrumentation and simulation for various applications, and affiliated with IESD, Banaras Hindu University as a faculty. He received his PhD degree from Department of Civil Engineering, University of Bristol, Bristol, UK. He has published 100+ papers in peer-reviewed journals, published 4 books with reputed publishing houses and authored several book chapters and conference papers. Dr. Petropoulos’ research work focuses on exploiting Earth Observation (EO) data alone or synergistically with land surface process models in deriving regional estimates of key state variables of the Earth's energy and water budget, including energy fluxes and soil surface moisture. He is also conducting research on the use of remote sensing technology in obtaining information about the land cover and if changes occurred from either anthropogenic activities (e.g. urbanization, mining activity) or natural hazards (mainly floods and fires). In this framework, he is researching and optimizing new image processing techniques to recently launched EO satellites, with a large part of his work focusing on the development and enhancement of EO-based operational products. As part of this research he is also conducting all-inclusive benchmarking studies to EO products or land surface models, including advanced sensitivity analysis techniques.